MA Fine Art students from Middlesex University will soon be showcasing their work in a new exhibition. Primary Colours, which opens on Thursday 11 September, will include work by Tess E Petersen, Sine Icli and Halgurd A M Baram. 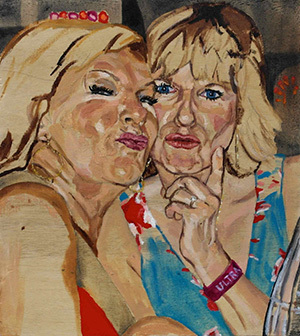 Tess E Petersen paints portraits exploring the ways in which women are portrayed in society. Using informal, candid smartphone photography as her source material, she depicts energetic, empowered and sometimes anarchic women. Sine Icli works in a range of media, from photography and printmaking to ceramics. 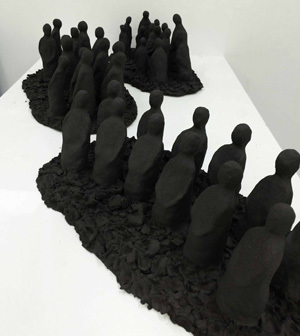 Icli's artworks examine and play on aspects of identity, the development of 'self' and the desire to belong. Halgurd Baram interrogates the political, aesthetic and philosophical legacies of conceptual art from the very particular perspective of a native Kurdish speaker. "The artists chose the name Primary Colours because it reflects the very distinct identities of their three bodies of work, and the wide variety of artistic approaches used. "As a metaphor, this can also be applied to the diversity of Middlesex's MA Fine Art student body, coming as they do from very different personal backgrounds and traditions of practice. "When primary colours are mixed, the entire rich spectrum of colour in art can be constituted. I think that's a good way to understand the collaborative processes which have produced this exhibition." The show will be on at the Fine Art Studios, G309, Grove Building, The Burroughs, Hendon. It previews on Thursday 11 September from 6pm-9pm, and then runs from Friday 12 to Monday 15 September (10am-4pm, closed Saturday and Sunday). There will also be a last chance to see the show and meet the artists at a closing event on Wednesday, 17 September, 4pm onwards.